(Newser) – China's moon rover Jade Rabbit has "experienced a mechanical control abnormality" that might scuttle its mission entirely. The problem came due to the "complicated lunar environment," the state-run Xinhua news service reported on Saturday, just before the rover went into sleep mode for the lunar night. Later, another report written as though from the rover's perspective said that engineers "are working round the clock. In spite of that, I know I might not be able to make it through this lunar night," the South China Morning Post reports. 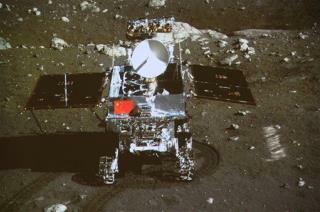 One cannot overstate the scientific importance of the Chinese lunar rover. In similar news, Ford Motor Company has announced the re-introduction of the Edsel. Don't they know that we tested our moon rovers, probes, and other vehicles at Craters of the Moon National Park and Barringer Crater before we sent it up for successful missions.